With so many microphones out there, it can be hard to know exactly which ones to pick for running a show. Perhaps even more confusing can be the years and years of convention that has whittled “microphone selection” down to just a small few contenders. When you factor a small budget into the mix, the selection gets even more challenging. So let's cut through the clutter and get down to brass tacks. Sure, there are a lot of great microphones out there, microphones that anyone and everyone would dream of having, but we're on a budget here, so this list consists of microphones all priced under $250 new. With a small budget, a truly great microphone collection can be well within your reach. So without further ado, let’s start the sound check! While this mic is considered to be the standard to which all other kick drum mics are compared, it should come as no surprise that we think the Beta 52 is the best choice for kick drum. Honestly, what makes it the best is not the sound quality that this mic produces, but rather the consistency of pure, great, live kick drum tone. When placed in any number of various kicks, no matter the size of shell, the type of wood or the style of music, the Beta 52 consistently communicates, “this is the kick drum,” and we thank Shure for providing our subs with something to kick out. This micro-condenser is right at home on a snare drum. With it’s flexible neck and brilliant anchoring system, you will be sure to find just the right placement and tone for that all-important “crack!” Drummers will also appreciate its low-profile design, providing them with more drum real estate for their backbeats, fills and rimshots. For the same reason that we love the Beta98 on snare, we gotta go with them on toms as well. Great classic melodic tom tones and precise accuracy. Afterall, you’ve got the spare phantom power on your board, might as well put it to good use! This little “pencil condenser” is ideal for drum overheads. With a very pleasant frequency range for cymbals, ride and hats, the 2021 is a truly capable, yet very affordable overhead mic. And for $79 a piece, they're at least worth a try, right? Originally meant as a kick-drum mic, the D112 is equally at home in front of your headliner's 8x10 cab. With its full, robust low-end response, and it's surprisingly clear hi-mid range, this mic is the perfect solution for when that bass player doesn't have a direct out of his amp, for some strange reason. It should be no surprise that this industry standard for guitar amp mic'ing is the choice here. The SM57 seems to capture the full range of guitar tones better than just about any microphone out there. This is especially true with clean amp tones. The SM57's open, yet concentrated sound profile just translates clean tones so well. And while many guys get caught up in mic placement (on-axis, off-axis, center of cone, off-center, etc) the truth of the matter is, in a live situation, you can pretty much just put this thing in front of a guitar amp and get great results. While not the original, highly coveted "black" version, the Sennheiser e609 "silver" is a fantastic live mic for guitar amps, especially dirty, crunchy and lead tones. The close, more compressed sound profile of this mic, in comparison to the Shure SM57 just seems to get the job done of getting those growling chords and soaring leads lines out to the screaming fans. And with its flat-face design, you can just dangle the dang thing down over the front of an amp and call mic'ed...hey, one last stand to strike when the show's over, right? There are always those occasions when you need to mic an acoustic instrument. Whether it be an acoustic guitar, auxiliary percussion, horns, or piano, it's always nice to have a couple of microphones available that can handle a lot of different needs and applications. AKG's Perception 170 or "P170" is a great little mic for all of these types of situations. With its overall flat response and accentuated higher range, and available 20dB pad, the applications of this little condenser are quite numerous. And heck, the price is so good you should probably pick up two of them! No surprises here, the Shure SM58 is the perfect choice for clear, warm, “in the mix” no-nonsense backing vocals. Essentially the same microphone as the SM57, there is something about that additional windscreen and pop filter that just makes this mic so good for smooth, worry-free vocals. While not the conventional microphone typically used for live lead vocals, the e835 is truly a brilliant choice, ensuring that the star-of-the-show's lyrics will cut through your instrument mix. 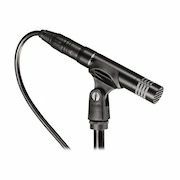 The e835 tends to have a higher presence and slightly higher output than the standard live vocal mic, which is why this mic is the "grab and go" solution for pristine "star" vocals. So if you're thinking about getting some new mics for a live setup, or maybe just need to replace a couple of old ones, hopefully this list has served you well. At the end of the day, however, the best microphones are always that ones that YOU know and trust...after all, you're the one that has to mix that Grateful Dead cover band on Friday night! So to all the fellow audio nerds and trail-blazers out there, good luck on your sonic endeavors, but most importantly, have fun on your quest! And, as always, if you like what you see here? SHARE IT!